How can managers help shape their employees behaviour? 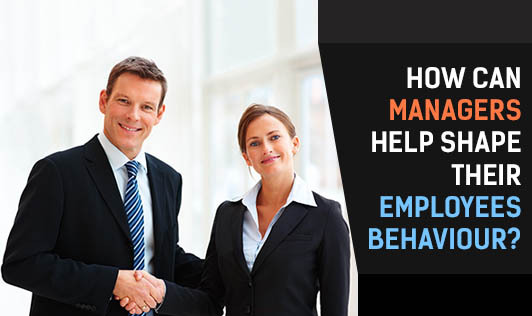 Behaviour is central to a productive and successful workplace. Organizations implement large change initiatives each requiring alternations to team behaviour. Success in this area is possible with concrete groundwork and time to adapt. The ability to modify an individual's behaviour is often the greatest challenge. • Firstly, it starts and ends with who you hire. Hiring people with values that align with your organization's values as well as those with a positive attitude, will ensure that you are more likely to encounter fewer problems within the team. • Communicate the kind of behaviour you want at work. Ensure that the expected behaviour is documented and visible to all the team members so that they need to know what behaviours you expect and want to see from them. The key is that the more you talk about it, the more likely you are to get it. • Model the behaviours you want to see as employees usually follow the example that is set by others in the organisation, thus taking cues for how to behave from those in charge. • Be watchful and pay attention to the team's behaviour. Managers need to ensure that this happens by paying attention to and addressing behaviour issues. • Reinforce right behaviours by recognizing and acknowledging it. On the other hand, if you want to see less of a particular behaviour, provide direct and constructive feedback so that the employee understands what's wrong. • Be consistent in your enforcement and reinforcement of behaviours. • Inspire your team by tapping into their motivation levels and passions at a much deeper level such as sharing stories, using inspiring language and communication tactics and personally or emotionally connecting with them. Remember that the only way to ensure success is to see how the behavioural changes are unfolding which involves following up and evaluating employee's progress regularly!